The success of director Billy Wilder’s American debut THE MAJOR AND THE MINOR (1942) endowed the rising auteur and his writing partner Charles Brackett with enough clout to begin producing their own films with Paramount. 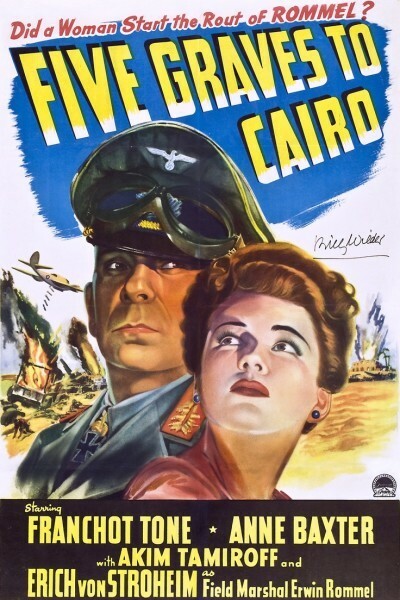 In the process of scouring the studio’s collection of narrative properties, Wilder and Brackett came across Lajos Biro’s play “Hotel Imperial”, and decided they would fashion it into a rousing wartime adventure picture called FIVE GRAVES TO CAIRO (1943). Being the first of only two war films in his entire filmography, FIVE GRAVES TO CAIRO would establish Wilder’s skills in the dramatic arena and raise his flag even higher over the mainstream cinematic landscape. Set during the North African campaign of World War 2, FIVE GRAVES TO CAIRO tells the story of Corporal John Bramble (Franchot Tone), the last surviving member of his British tank infantry, who has just emerged from the desert and been rescued by the kindly staff of the Hotel Empress Britain. Not long after Bramble arrives and recovers, the Nazis roll into town and quickly commandeer the hotel as a home base of their own. In an effort to hide his Allied affiliations, Bramble takes on the persona of Davos, a hotel servant who was killed during a recent air raid. The plot thickens when it’s revealed that Davos was a German spy, and Bramble embraces this aspect of the dead man’s identity as an opportunity to gather valuable counter-intelligence on the Axis campaign in Egypt. While he flits about the shadows and manipulates the German officers into revealing information, he must also disarm their growing suspicions against his true identity. Peter Van Eyck, as Nazi Lt. Schwegler, becomes the primary avatar for these suspicions, parlaying his concerns to his commanding officer, Erwin Rommel (played gloriously by one of Wilder’s personal filmmaking heroes, Erich Von Stroheim). Bramble’s allies amidst the hotel staff include Farid (Akim Tamiroff)– the hotel owner and a constant source of comedic relief– and an elegantly pragmatic chambermaid named Mouche (Anne Baxter) who makes the ultimate sacrifice in service to the British Crown. FIVE GRAVES TO CAIRO could very well be a major influence on Steven Spielberg’s RAIDERS OF THE LOST ARK (1981), but the film itself is undoubtedly influenced by the previous year’s smash hit, CASABLANCA. The arid deserts of Indio, California stand in for the fictional Egyptian sand-scapes in which FIVE GRAVES TO CAIRO takes place. When the film was made, the events depicted in the story were still unfolding on the world stage. Audiences of the time no doubt found the story to be very timely, but seventy-plus years after the fact, the heroic, rah-rah tone might besiege modern viewers with the stench of propaganda. Thankfully, Wilder recognizes some of the inherent absurdities of warfare, and takes the opportunity to milk every last ounce of comedic potential from his narrative. Perhaps the area that sees the greatest growth of Wilder as a director is the film’s visual presentation. The first of four collaborations with cinematographer John Seitz, FIVE GRAVES TO CAIRO sees Wilder expand the scope of his storytelling with dramatic compositions and confident camerawork. Shot on black and white 35mm film in the standard 1.37:1 aspect ratio, the film allows Wilder ample opportunity to experiment with the usage of shadow and light. His delicately-sculpted chiaroscuro, like the stark overhead light from a bare lightbulb or the geometric illumination of complex window patterns, foreshadow Wilder’s coming innovations within the film noir genre while reinforcing his artistic convictions about light as a crucial storytelling tool. Wilder and Seitz employ considered dolly moves and zooms to a much more elaborate degree thanTHE MAJOR AND THE MINOR, but always in deference to character and story over flash. One of the most notable tracking shots in FIVE GRAVES TO CAIRO is also one of the most subtle– a lateral descent along the y-axis that keeps Mouche’s face centered in close-up as she walks down a flight of stairs. The shot keeps the emotional momentum of the scene going while allowing the audience to register the roiling, complex emotions Mouche is feeling as she descends the staircase to certain doom. Editor Doane Harrison’s minimalist influence on Wilder continues to be felt in FIVE GRAVES TO CAIRO, where the application of an in-camera approach to editing results in an effective and disciplined use of coverage. There are no frivolous shots that might detract from the focus. For instance, there are only 2 cutaways to airplanes flying overhead during the climactic air raid sequence. Instead, Wilder keeps the perspective squarely on the ground, his camera following Bramble and his allies as they scurry for shelter amid the chaos. Other collaborators of note include famed costumer Edith Head (best known for her work on Alfred Hitchcock’s films), and composer Mikols Rozsa, who crafts a swashbuckling and brassy score appropriate for the film’s adventurous tone. Despite FIVE GRAVES TO CAIRO’s affectations as a somewhat-disposable adventure film, Wilder can’t help but use the story as an opportunity to further explore the idea of class conflict– a theme that Wilder would spend his career mining for material both dramatic and comic. This film meditates on the struggles between two uniformed classes: the military and hotel servants. Both groups typically operate in service to a higher entity (hotel employees to their guests and the military to their government), but the military quickly takes on the role of pampered aristocrat as soon as they arrive. Wilder’s sympathies typically lie with the put-upon class, and FIVE GRAVES TO CAIRO doesn’t break from the formula– positioning the plucky, outnumbered chambermaids and waiters of the Hotel Empress Britain as the heroes of the story. The production’s immediate connection to the then-current event of World War 2 (which still had several years of conflict yet) can’t help but imbue the film with the manipulative air of propaganda, especially at the film’s conclusion when Bramble heroically runs off to join the British advance to victory. In a way, it’s fairly naive in its ignorance of some of the darker revelations that would come out of the conflict only a few years later. For instance, the Nazis are depicted as civilized– if misguided patriots– of their homeland; there’s a memorable line where Rummel announces that they will conduct Mouche’s criminal trial under the Napoleonic code, just to prove that they aren’t barbarians. Although Wilder had fled the Nazis himself and bore witness to some of their earlier atrocities, the larger horrors of the Holocaust had yet to be revealed– and his mother had yet to fall victim to them. If FIVE GRAVES TO CAIRO had been made after World War 2, it isn’t hard to imagine that Wilder might’ve have painted his villains in a much more damning light. FIVE GRAVES TO CAIRO premiered in 1943 to mixed reviews, unable to achieve the same success that was bestowed uponTHE MAJOR AND THE MINOR. The bulk of the film’s critical merits went to its technical accomplishments, culminating in three Oscar nominations for Best Cinematography (Black And White), Best Art Direction, and Best Film Editing. WhileFIVE GRAVES TO CAIRO would quickly become overshadowed by Wilder’s bigger hits still to come, it stands on its own merits as a competently-made war film and a window into the fledgling auteur’s maturation into a confident, accomplished director. FIVE GRAVES TO CAIRO is currently available on standard definition DVD via Universal Pictures and Turner Classic Movies.